Walden can be a narwhal or a whale (you choose!). Using a heavy worsted weight yarn he measures 17 inches long (horn included), so he is nice and big and cuddly. This narwhal amigurumi pattern includes step-by-step photos and you can contact me along the way to ask any questions. 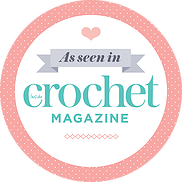 It is an intermediate level pattern that involves starting with a magic ring, single crochet, colour changes, increasing, decreasing and attaching pieces. This guy is huge 🙂 I am almost done making this beautiful creature and ran out of fiberfill! Gggrrr, hate when that happens. I’ll be at the store as soon as it opens today though so I can finish off his backside. I love this pattern. This is the first one I have purchased from you and I really like your style. Thanks! Oh yay! So happy you like him 🙂 Yes, he is surprisingly BIG! haha! He eats up a lot of stuffing, but that does make him nice and fat and cuddly.